On March 26, 2019, the Board had the unique opportunity to have dinner with Dr. Jim Kirkpatrick, Senior Consultant at Kirkpatrick Partners, a company dedicated to the four levels of evaluation. Dr. Kirkpatrick discussed the future of training, the importance of demonstrating ROI, and of course, the four levels of evaluation. Did you miss the 1st Annual Mid-Atlantic TDPC Conference on December 1, 2018? Check out the highlights and join our mailing list to ensure you never miss another Greater Richmond ATD Event in the future. "My Purpose is to Help Others Dream Big and Achieve"
Not a member? There has never been a better time to participate in your community of talent development professionals. Learn more about Member Benefits. If you purchase something at the ATD store (Visit Here) remember to use CH4041 for the CHiP/International Partner code. Some items may even be discounted! 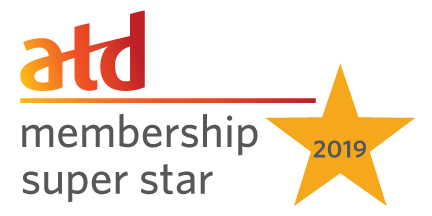 Using the code is easy and will benefit you and YOUR Greater Richmond Chapter of ATD. Chapter Affiliation Requirements (CARE) are a set of performance guidelines designed to help chapters deliver consistent benefits to members. CARE consists of elements in five key areas that are necessary for running a chapter like a business: administration, financial, membership, professional development, and communication. We are proud to partner with Wizard Wall, a company offering innovative solutions for your training needs. Greater Richmond ATD members can receive a 30% discount off the regular price. UMU is a proud sponsor of the Richmond ATD. Get a chance to see UMU's blended learning technology at our programs and events! organizational capabilities through career development and networking.